Fight Back! 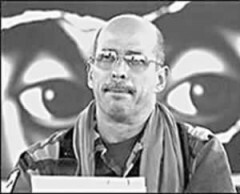 interviews Oscar Silva, Lawyer to Ricardo Palmera | Fight Back! Fight Back! interviewed Oscar Silva, the Colombian lawyer for U.S. political prisoner and Colombian revolutionary Ricardo Palmera. The U.S. government is holding Palmera in a prison cell without access to his lawyer, reporters or his family and friends. Palmera, born to a wealthy family, has dedicated his whole life to the working class and peasant farmers of his country. Palmera’s only crime is to struggle for the Colombian people and their right to rule their own country. The trial is a sham and is an attempt to criminalize one of the leading groups fighting for Colombia’s liberation - the Revolutionary Armed Forces of Colombia (FARC). Fight Back! : The U.S. public defense lawyer for Ricardo Palmera called you to testify. What did you say? Oscar Silva: The U.S. federal defense lawyers of Ricardo Palmera called me to testify in front of the court because the FBI agents were inventing interviews with Ricardo Palmera. These interviews appear to be falling apart in court. I was called to appear in the court to disprove the authenticity of these interviews. One in particular, that took place on April 2, 2004, in the Combita prison, where the FBI agents Alexander Barbeito and Roy Le Blanc asked Ricardo Palmera to be a go-between, to in effect pass along some medicines, eye glasses and to provide proof of the well-being of the three Americans detained by the FARC, the Revolutionary Armed Forces of Colombia. This interview had only humanitarian aims and was not an official visit, because to be a visit with legal aims, the FBI would have had to follow the Miranda Law - to read him his rights before the interview. To make their case now, the FBI are claiming it was a formal interview. They never read my client his rights and did not initiate a formal process before the court. Furthermore they want to take this interview as evidence to the court. Then the FBI invented two more interviews as evidence in the court. Fight Back! : As Ricardo Palmera’s lawyer in Colombia, can you tell us what you think of his extradition and trial in the U.S.? Oscar Silva: The extradition was by any reckoning illegal and it violates the judicial sovereignty of Colombian courts. President Uribe used it as a pressure tactic, to secure an approach for peace talks with the FARC. I have already made a statement in Colombia denouncing the illegality of Palmera’s extradition. It helps the Palmera case that we are able to render, or to throw out, the interrogations of the U.S. lawyers. If that is all they have, then we are seeking that the court renders all their contributions. Fight Back! : Can Ricardo Palmera get a fair trial in the U.S.? Oscar Silva: We think a fair trial is formally possible, but the FBI is in charge of collecting evidence, and the FBI agent claims that there were interviews with Ricardo Palmera even though Ricardo Palmera says he never grants interviews. There is great pressure from the Colombian government for Ricardo Palmera to be convicted and we think that while this heavy pressure exists, having a fair trial is prohibited or in doubt. The unique condition that needs to exist for a fair trial is that on or near March 7, Judge Hogan indicates that he is excluding the groundless evidence that was invented by the FBI agents. If the judge decides to the contrary, that is to say, if he accepts the interviews, then Ricardo Palmera cannot receive a fair trial. Fight Back! : Is it true that there are ongoing trials against Ricardo Palmera in Colombia, while he is also on trial in the U.S.? How can it be fair if he is not present at the trials? Oscar Silva: In fact, the Colombian courts are pursuing 45 cases against Ricardo Palmera without his presence at the trials. Furthermore, although the U.S. government knows about his trials in Colombia, the U.S. government will not allow me a meeting with Palmera to deal with his cases in Colombia. It creates a situation where Ricardo Palmera’s right to a defense with the assistance of a lawyer is severely harmed. On the last occasion that I was in Washington D.C., the U.S. government authorized an interview with Ricardo Palmera, but said it was to be recorded by agents of the U.S. Department of State and the FBI, because they claim that I, as his lawyer, have direct contact with the members of Secretariat of the FARC. This is false. They claim it is possible to pass messages and to receive instructions from Mr. Palmera for the FARC so that they can complete them. Fight Back! : Is it dangerous for lawyers in Colombia to take on the cases of known revolutionaries, members of the FARC? Oscar Silva: Yes it is dangerous to take cases of members of the FARC in Colombia. In total, it is another and I, defense lawyers, who assume the defense of any citizen captured in our country. Since I came back from Washington D.C., I have been harassed. In spite of that I have not received any kind of protection. Fight Back! : Why did you take on the case of Ricardo Palmera? Oscar Silva: I took the case of Ricardo Palmera, although he had received offers from close to seven offices of prestigious lawyers. I had the opportunity to visit him, because a lawyer colleague of mine in Valledupar, she called and said to me, “Please come to visit him and see if he needs any personal stuff.” I was there a while, we were chatting for nearly 30 minutes and then he said that he wanted me to be his lawyer. The lawyer could have been another person, but in his wisdom, he chose to make me his lawyer. It seemed absolutely normal to me, since I have received cases of people who belong to other types of political ideologies and as a lawyer I must defend the person, not an ideological tendency. Fight Back! : Why is it not possible to put U.S. soldiers and U.S. officers on trial in Colombia even though they commit drug trafficking and weapons sales crimes? Oscar Silva: It is not possible because of the whole series of legal concessions granted to the U.S. government by the Colombian government. The concessions harm Colombian national and judicial sovereignty. They create distrust with Colombia’s own judges. It introduces political themes in cases of ordinary crime. If they were put on trial in Colombia, the Department of State would be politically interfering in the judicial process. So then it will seem that the Colombian government has no confidence in the impartiality of their own country’s judges.